Roland’s compact segment is definitely proving to be among the most interesting ones on the market. One of the better amps from that lineup is the Roland Blues Cube Hot. It is by far one of the most outstanding guitar amps you can get for less than $500 right now. The somewhat simplistic and retro design of Blues Cube doesn’t only apply to its finish. Roland pretty much used the same approach when designing the control cluster for this amp. In a world full of complex modeling amps with all of their fancy effects, Roland took a completely different route. The name Blues Cube offers some answers as to why. The control cluster is simple and includes a volume knob, a three-band EQ, a Reverb knob and finally the Master level knob. To the right of that, there is an attenuation switch, making this combo a perfect choice for both home use and light gigging. If you are wondering, there is only once channel available, which is usually not a great thing. However, in case of Roland Blues Cube, it is. It is apparent that Roland wanted to create a solid base for proper tone building. 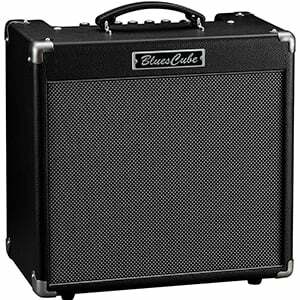 The core of Roland Blues Cube consists of its 30 Watt power amp and a single 12 inch speaker wired to it. The amp is extremely simple, which explains its somewhat light weight nature. There is one more thing, though. Blues Cube comes with Roland’s Tube Logic technology, which is designed to tune the performance of the amp in a way that makes it sound like a proper tube amp. But wait, there’s more. This is a solid state amplifier which you can actually push into overdrive. How incredible is that? Roland has also included two buttons found in the control cluster, which determine the nature of the overdrive. You can choose between a genuine tube crunch and a more treble heavy overdrive with a press of a button. Even though it’s not as versatile as most modeling amps of today, Roland has delivered something truly unique. Here’s where things get really interesting. When you first read about Tube Logic technology and how it works, you might get a feeling that Blues Cube is nothing more than just another over hyped emulator. All of that changes the moment you plug your guitar into this thing and turn that volume up. For starters, the clean channel is beyond impressive for such a small build. It offers all of the benefits you would expect from a good, vintage tube clean channel, without all the negatives. Pushing the amp into overdrive almost feels unreal. The way it responds and the way it emulates that tube sweet spot is impressive. Further more, you can really explore this by attenuating the amp, just like you can most real tube models. If you’re in love with a classic tube sound but can’t afford to get it, Roland has created the next best thing. Roland’s Blues Cube Hot is on a whole different level of unique for a solid state amp. While many have tried to emulate tube amps before, it feels like Roland is one of the few who have actually managed to do it. That deserves respect. Blues Cube is absolutely incredible. For more info about the Roland Blues Cube Hot, click here. For more Best Guitar Amplifiers Under $500, click here.